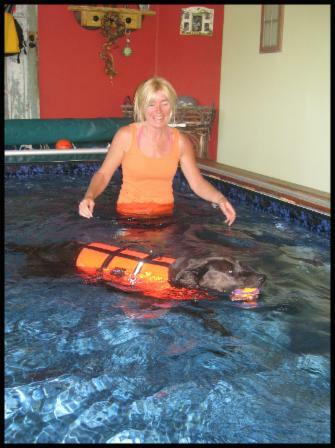 Deb D'Andrea offers PawQuatics which uses the power of water to assist your dog's body's healing process. Water has a natural resistance to movement and offers buoyancy, and there is less stress on the body overall; thus, you have freer movement in a safe environment. Geriatrics, arthritis, paralysis and other mobility issues; pre and post surgical procedures; injury prevention; and to help body awareness, balance and coordination; PawQuatics will assist your dog on several levels. A five minute swim is equivalent to a five mile run as the resistance in water is fifteen to twenty times that of moving in air! I offer a combo PawQuatics with Canine Massage. Each dog is different, with various goals. PawQuatics offers everything from a fun exercise of chase the tennis ball to power swimming, followed by a massage in the warm water. The goal is to offer a relaxed, safe atmosphere where your dog can feel free to swim and work through their individual programs. 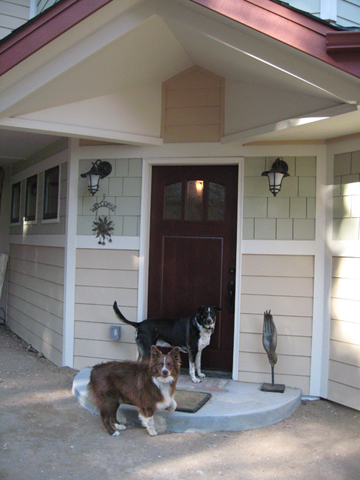 Ever felt guilty heading out the door for your massage, leaving your beloved dog behind. Not anymore! The Dog-Gone-Good Massage is where you and your dog experience the therapeutic and relaxing benefits of massage together. Select either a half hour or hour massage, and you both will leave Soul Namaste Spa relaxed and balanced. Massages are provided in separate rooms, at the same time. So, as you're heading out for your massage, bring your dog and have a Dog-gone-good time together! PawQuatics also offered for your dog while you receive a massage! Everyone is howling over it! Contact me to discuss PawQuatics. You can email me directly, or complete & submit this simple form.